Just finished reading Pike Place, debut novel by Marilyn Howard Tschudi. When I downloaded it as an ebook courtesy Amazon I scarcely thought that a debutant could write such a strong book, especially as it centered around a kid acting as sleuth. However as I continued, the story became larger than life, impressing me with its well drafted plot and superb narration. In fact, in the second chapter itself I forgot that the story was being narrated by a ten year old girl. She was so mature in thoughts and writing was so deft that I was totally absorbed in the narrative. 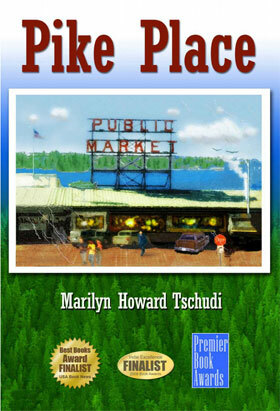 In Pike Place, the story revolves around Johnson family, who have recently shifted to Seattle. Roberta aka Bobbi is the fourth child of Mr. and Mrs. Johnson and like any normal kid, she believes biking to be the best sport and her Tree House the best place in whole world. Scottie her younger brother and Lizzie her best friend are two of her most worthy companions. But beyond this harmless innocence, Bobbi possesses a rare strength. She is an astute observer, a diehard fan of Hardy Boys and courageous enough to face any small adversity, her protected childhood could be threatened with. As the novel progressed, it became apparent that Seattle has more mysteries than are visible on the surface. The story is set in Hippie era and strange happenings in nearby woods is the talk of town. And one fine day, Bobbi’s lovable elder sister Angela disappears. She usually passed through those lonely woods and her sudden missing alerts the city cops. The incident is quickly followed by a fire in a neighboring haunted house and talks are abuzz that the deserted mansion was being used for some illegal activities. What is actually happening in Seattle? Are the two incidents related? Has Angela fallen in bad company or something terrible has actually happened to her? As I rushed along with Bobbi Johnson, trying to solve the mystery, I had a great time, enjoying the meandering thoughts of a pre teen girl in first rushes of youth, trying hard to hide her crush behind false facades and at the same time acting beyond her years to trace her beloved sister. Pike Place is a unique novel for me. I am not a big fan of YA novels and usually steer clear of wannabe detectives as well. But Pike Place mesmerized me with its heady combination of thriller and literary fiction, surprisingly well written. The book gives a sneak peek into the simple world of children, who do understand everything their adults try to brush off and yet with their magnanimous innocence, accept rude reactions and try to act normal. Though, it can hardly be termed as a children book, as basic premise is founded on a very sensitive topic of child abuse. I loved the way Marilyn expounded on the history of Richland, brought alive the less explored down town of Seattle, exposed the qualms of living in a nuclear plant town, all through the eyes of a ten year old girl. Though, at times I found it strange that Johnson family indulged in friendly dinners while Angela was missing, but as I progressed I realized that it was a desperate attempt on their part to return to normalcy and save their other kids from being affected by the unforeseen tragedy. However, they scarcely knew that their girl was female equivalent of Holmes and she is not going to be a mute spectator and would actually end up being the main protagonist. The only thing that irked me was that the title was hardly justified in the story. In fact, it wasn’t even mentioned till one third of the book! But, at the end of the day, it didn’t really matter as I was totally engrossed in the story and forgot about it till the the very end. Though the book is written in a light, humorous vein, the message it conveyed was actually quite strong. Through Bobbi, the author made me realize that it’s not right to close your eyes to evil, but rather it should be dealt with in a straightforward fashion. I loved the way, Marilyn steered the story from one event to another, included interesting incidents from past and even referred to the reading habits of our smart protagonist. For me, the story achieved a climax in the second last chapter itself, but I still liked the way Marilyn chose to close it in present times, fast forwarding the novel by fifteen years, proving that our childhood impressions actually shape up our real life and those influences never die. More than anything, it made the book look even more real and elevated it to the status of a memoir rather than just a lit fiction. All in all, Pike Place is a great debut by the mighty pen of Marilyn and justifies all the awards she has been showered with. I would love to explore more of her books.